Recent studies have raised concerns that tropical cyclones (TCs), particularly severe TCs, have become more frequent in many places in response to global warming. Other studies discuss errors in TC data that can cause large inaccuracies in some of the observed trends. 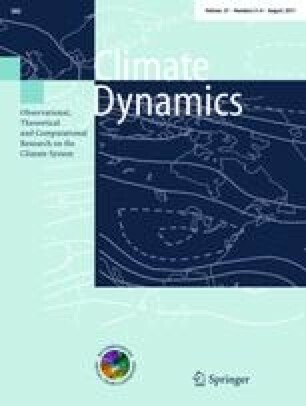 Additional studies conclude that TCs are likely to become more intense in the future in response to global warming, while regional modelling studies for the south-west Pacific near north-eastern Australia project an intensification of TCs and either a decrease or no change in TC numbers. Here we describe and use a new data base of severe land-falling TCs for eastern Australia derived from numerous historical sources, that has taken over a decade to develop. It provides one of the world’s longest reliable records of tropical cyclone activity, and allows us to document changes over much longer periods than has been done previously for the Southern Hemisphere. Land-fall numbers are shown to vary a great deal on interannual, decadal and longer time-scales. The interannual variability is consistent with previous studies using much shorter data sets: land-fall numbers are well-simulated as a Poisson process and are modulated by the El Niño-Southern Oscillation (ENSO). Land-falls occurred almost twice as often in La Niña years as they did in El Niño years, and multiple land-falls only occurred during La Niña years. The statistical link between land-falls and pre-season values of the Southern Oscillation Index provides a modest predictive capability. Decadal variability in ENSO drives some of the decadal variability in land-fall numbers. The sign and magnitude of trends calculated over 30 years periods vary substantially, highlighting that caution needs to be taken in making inferences about trends based on e.g. satellite era data only. The linear trend in the number of severe TCs making land-fall over eastern Australia declined from about 0.45 TCs/year in the early 1870s to about 0.17 TCs/year in recent times—a 62% decline. This decline can be partially explained by a weakening of the Walker Circulation, and a natural shift towards a more El Niño-dominated era. The extent to which global warming might be also be partially responsible for the decline in land-falls—if it is at all—is unknown. This work was partially supported by the Australian Climate Change Science Program, which is administered by the Department of Climate Change and Energy Efficiency. Scott wishes to thank John McBride for helpful discussions and both Jim Kossin and Neil Holbrook for helpful comments on an earlier draft. The primary source of information for the severe TC (Category 3, 4 or 5) data base is the Bureau of Meteorology’s collection of comprehensive case histories for many TCs—including all TCs since the mid-1950s. The two most important sources prior to this are (a) a collection of numerous bounded meteorological analyses made by the Bureau of Meteorology covering TCs back to the 1890s, and (b) several newspaper archives. During the late nineteenth century and early twentieth century newspaper reports (prior to the publication of photographs in newspapers) provided highly detailed descriptions of land-falling TCs, often from a large number of eye witnesses. In addition, many people at the time had barometers and made pressure readings associated with land-falling TCs available for publication in newspapers. Please contact the authors if you have historical information regarding nineteenth century or early twentieth century TCs not included below. 28 December 1873 A TC hit Bundaberg. Thirteen houses were blown down and some entirely destroyed. Hotels and commercial buildings were unroofed and farm houses were blown flat to the ground. Schooner James Nash lost with seven on board. 17 February 1876 TC hit Bowen and Townsville. In Bowen a child was killed and many people were injured by flying debris; a horse was cut in two by a flying sheet of iron; several buildings including the hospital were blown down while others were shifted or greatly damaged. 21 March 1876 TC was located near the northeast tip of Hinchinbrook Island with gales extending south to Townsville. Analysis showed that the 82 ton Steamship Banshee was most likely driven onto the rocks at Cape Sandwich by hurricane force winds which prevented the vessel from clearing the rocks even though it was under steam power. Banshee wrecked with seventeen persons drowned. Severe TC inferred. 8 March 1878 TC hit Cairns. Tropical cyclone struck Cairns. The Steamer Louise, and sailing vessels Merchant, Kate Conley and Hector Miss were sunk in Cairns inlet with no survivors ever found (Johnston 1986). Many properties in Cairns destroyed by wind. 2 February 1882 TC hit Cardwell. A hotel and three houses were blown down and a number of other houses unroofed. A boatshed was demolished; the boats were broken up and the jetty was swept away. 30 January 1884 TC hit Bowen. Numerous buildings blown down or badly damaged. Only three houses were left standing. There was a large-storm surge at Poole Island, where a steamer launch and all punts disappeared; the Pilot Shed was flattened and all pilot boats and the cutter were swept away. 21 January 1887 A TC hit the coast near Brisbane. Extensive sea damage occurred at Sandgate. Flooding caused 21 people to drown. 24 March 1890 A TC crossed coast near Cardwell and recurved over Fraser Island on 28 March. At South Barnard Island 4 men were drowned by wild seas and storm surge and the only house on the Island was destroyed by the wind. At Cardwell only four houses were left standing, the rest were wholly blown down, unroofed or destroyed. Further south around Ingham many buildings were destroyed with two deaths and on the nearby coast there was a large storm surge wrecking five marine craft. At Townsville the wind wrecked 15 small houses, blew 30 homes blown off their blocks, 40 verandas wrecked and three or four houses washed away by a storm surge. Heavy seas rolled over the top of the Breakwater which was 2 m above high water spring tides. Four vessels were sunk and there were two deaths from drowning. There was further severe wind damage as far south as Ayr with building destroyed and another 10 fatalities in central and southern parts of Queensland. 2 Apr 1892 TC passed near Brisbane causing two deaths. Clement Wragge quoted the wind strength in Brisbane as 60–70 knots. There was widespread structural wind damage in the City, New Farm, South Brisbane, Highgate Hill, Coorparoo, Kangaroo Pt, Spring Hill, Red Hill, Paddington, Toowong, Samford Rd, Breakfast Creek Eildon Hill, Hamilton, Runcorn, Redland and Beenleigh. Widespread damage also occurred from Southport through to Tweed Heads. 1 February 1893 TC hit Yeppoon. The chief meteorologist of Queensland—Mr. Clement Wragge—was aboard the steamer Buninyong near Middle Percy Island when at 0200UTC 31 January 1893 he recorded a barometer reading of 968 hPa and sustained winds of 85 knots just before a tropical cyclone made landfall on a remote part of the coast 90 km north of Rockhampton. As the cyclone made landfall the town of Marlborough (60 km west of the track) reported a ‘tremendous quantity of trees down everywhere’. The cyclone then travelled overland turning southwards towards Yeppoon passing west of the town at 9 am 1 February. Reports from Yeppoon indicated many trees uprooted, houses unroofed and widespread damage all over district. The cyclone then turned into a rain depression and created an Australian 24 h rainfall record when the Crohamhurst Observatory just north of Brisbane recorded 907 mm in 24 h. Disastrous floods caused 23 deaths in Brisbane and at least 5 more deaths in Maryborough. Pressure dropped to 969 hPa. The 225 ton steamer Dickey was wrecked. 26 January 1896 TC Sigma passed just to northeast of Townsville. Ships were wrecked in the harbour and widespread wind damage occurred in the city. Floods and storm surge flooded the lower parts of Townsville and 17 people drowned as a result. One sailor was also killed. 4 February 1898 TC Eline passed near Mackay. Many buildings were unroofed, blown down or otherwise badly damaged. Floods shortened the path of the Pioneer River to the sea by 4.8 km (to its present course). Lowest pressure reading at Mackay was 984 hPa. All the buildings on Flat Top Island were destroyed except the lighthouse. 9 March 1903 TC Leonta re-curved over Townsville. Pressure reading was 965 hPa. Severe wind damage occurred. The hospital and the brick Grammar School were destroyed. There were 10 deaths in total, including 8 in the hospital. 27 January 1906 TC crossed the coast at Cairns. Half of Chinatown was completely wrecked. Two hotels were unroofed and another was wrecked. A boarding house was unroofed, a church was blown off its stumps, and five commercial premises were destroyed or badly damaged. All private dwellings suffered damage. Many buildings were destroyed in Innisfail. 16 March 1911 TC crossed the coast near Port Douglas. A pressure reading of 959.7 hPa was taken by a ship at Low Woody Island (17 km south of Cape Flattery). Two lives were lost at Port Douglas and only 7 out of 57 houses were left standing with 100 people left homeless. Similar damage occurred at Mossman. Severe damage also occurred in Cairns. 23 March 1911 TC wrecked the ship Yongala (3664 tons) just to the east of Townsville. One hundred and twenty lives were lost. One of the searchers reported that a few miles south of Cape Bowling Green a vast swathe was cut through the bush with every tree uprooted or snapped off. Another searcher found the northern side of Cape Upstart swept clean of trees, snapped off 8 feet (2.5 m) from the ground. 31 January 1913 TC crossed the coast near Cairns. The front of the Stock Exchange was blown in, the rice mill on the Esplanade was severely damaged, balconies were stripped off buildings, two houses were lifted completely off their stumps, a sawmill was unroofed and other sheds were unroofed. Many trees were blown down. There was a large storm surge damaging many boats and smashing the seawall. All trees were blown down on Green Island and it was denuded of vegetation. Seas broke right over Upola Bank. There were four lives lost and the Schooner Dancing Wave went missing. 9–11 February 1915 TC moved parallel to the coast south of Townsville and passed over Fraser Island with a central pressure of 970 hPa. At Bundaberg westerly winds reached hurricane force and the pressure dropped to 983.1 hPa. A number of buildings in Bundaberg suffered considerable damage and many trees were blown down in the surrounding country. The school was blown down at Pialba. Two men drowned in the Stanley River at Woodford. 27 December 1916 TC crossed the coast near Dent Is. The pressure dropped to 958 hPa. Lighthouse installations at Dent Island and Flat Top Island were badly damaged. The TC then moved into the Clermont area causing disastrous floods and the loss of 62 lives. 21 January 1918 A TC crossed the coast just north of Mackay. The lowest pressure of 932.6 hPa was recorded near the eye. The Harbour and Rivers engineer reported sea water inundation reaching a height of 7 foot 9 inches (2.36 m) above the highest spring tide level. Hardly any building in Mackay escaped damage and about one thousand buildings were destroyed. Two men were drowned at Rockhampton and a man drowned at Yeppoon. In Mackay the death tally was 20. In total 30 people lost their lives in the cyclone and the subsequent floods in Central Queensland. 10 March 1918 TC crossed the coast and passed directly over Innisfail. A barometer reading of 926 hPa was recorded at the Mourilyan Mill. In Innisfail, then a town of 3,500 residents, only around 12 houses remained intact. A report from the Harbours and Marine Engineer indicated that at Maria Creek the sea rose to a height of about 3 m above high water. Recent reports suggest that 37 people died in Innisfail while 40–60 (mostly aborigines) lost their lives in nearby areas. 5 April 1921 TC passed to the east of Bustard Heads. The pressure dropped 979 hPa. The TC passed over Bundaberg where numerous houses lost their roofs. 9 February 1927 TC crossed the coast just to the north of Cairns. The lowest pressure reading at Cairns was 971 hPa. Many buildings were unroofed or damaged and some 16 totally destroyed. Unprecedented floods occurred and many people drowned, 23 at Ingham, 15 at Cardwell and 1 at Townsville. Flooding also occurred in the south of the state with a drowning in Surat, a drowning at Toowoomba and seven additional people drowned near Miles. A total of 47 people lost their lives. 14 February 1928 TC crossed the coast at Brisbane. Subsequent serious floods in south-east Queensland with 5 people drowned. Widespread damage about the border with buildings unroofed at Coolangatta, Tweed Heads, Bilinga, Murwillumbah, Mullumbimby, Byron Bay, Bangalow, Barneys Point, Duranbah, Bingham Point and Cudgen Headland (now Kingscliff). 18 February 1940 TC crossed the coast near Cardwell. The pressure dropped to 965 hPa. Huge seas left a trail of damage along the strand in Townsville. In Ingham, the police house, church and two hotels were unroofed and badly damaged. The Italian Club was lifted and carried 90 metres down the street. Nearly every building in the town was damaged. 2/3 March 1949 TC struck Gladstone at 2 pm on the second and then passed over Rockhampton. Wide-spread damage occurred in 15 towns. Two men died, one in Rockhampton, the other in Gladstone, as they were blown from the roofs of their homes while making repairs. Another man was killed in Rockhampton after being struck by a falling branch. A child was killed in Bundaberg by a falling gum tree. A dairy farmer drowned in the Biloela district and another man drowned near Thangool. Pressure in Rockhampton dropped to 960 hPa and the maximum wind gust on the airport anemometer was 87 knots just after 7 pm on the second. In Rockhampton 1,000 houses were damaged, 500 were wrecked. Most of the 1500 homes in Gladstone were damaged and many buildings were extensively damaged. 12 homes were badly damaged in Yeppoon and 25 inches (635 mm) of rain was recorded there in 24 h, which flooded business premises. In Emu Park most of the 200 houses were damaged while the Yeppoon to Emu Park scenic road was devastated with trees littering the whole highway. Heavy seas closed the ports of Rockhampton, Gladstone, Bundaberg and Maryborough while a lightship was grounded on Breaksea Spit. There were severe floods in the Central Queensland and 3 drovers were drowned. 11 March 1950 TC crossed the coast at Carmilla (S of Mackay) with severe structural damage. At Carmilla one girl was killed and four others injured. Trees a metre in diameter were uprooted. 400 people lived in the area and only eight buildings were left standing. The hall and three houses were completely wrecked. 15 business houses and the school residence were uninhabitable. Every other house in town was unroofed. 20 farmhouses within 16 km of Carmilla were battered with windmills destroyed. Rail and farm buildings were damaged between Kalarka and West Hill. 20 February 1954 TC crossed the coast at Coolangatta. Pressure was recorded at 973 hPa. Other reports from the Coolangatta/Tweed Heads area had pressure readings down to 962 hPa. The worst damage in this general area occurred around Cudgen in NSW, where houses were blown apart and trees more than 1 m in diameter were twisted out of the ground. A record low reading of 982.7 hPa was recorded in Brisbane. Widespread structural damage occurred on the Gold and Sunshine Coasts, and around Brisbane. A 0.64 m storm surge was recorded in Moreton Bay. Much higher rises were evident on the foreshore, where boats were seen in tree tops at Beachmere. Waves at Kirra on the Gold Coast brought 2 m of water onto the highway, picking up cars. 900 mm of rain was recorded at Springbrook in the 24 h period up to landfall. Floods combined with storm surge on the Nerang River and caused evacuations of families and a dramatic rescue of people from Macintosh Island. The floods and cyclone then hit the Lismore district with gales whipping up large waves on the then 11.3 km wide Richmond River. 26 people died from these unprecedented events. The outer section of the jetty was swept away at Byron Bay taking with it all 22 vessels comprising the entire fishing fleet. The sea broke through and flooded parts of the town in Byron Bay. There were two barometers at the Condong Sugar Mill. One registered 28.8 inches (975 hPa) while the other registered 973 hPa. The eye took 2 h to pass over the mill. The eye passed over around 11 pm. 7 March 1955 TC crossed coast just south of Mackay. The eye passed over Sarina and the pressure dropped to 963 hPa. The lugger Barrier Princess was lost with eight hands. This was accompanied by widespread structural damage and heavy flood rains. 6 March 1956 TC Agnes passed over Townsville. The meteorological office recorded a pressure reading of 961 hPa. There was widespread damage between Cairns and Mackay. Maximum wind gusts of 73 knots at Townsville and 79 knots at Cairns occurred. Four deaths occurred from floods in the interior. 1 April 1958 Small intense TC hit Bowen. Gusts to 98 knots were observed at Bowen until the anemometer was damaged. 77 houses and various buildings at Bowen were destroyed, and many other buildings were damaged. The TC caused a 2 m storm surge in Bowen. 16 February 1959 TC Connie crossed the coast at Guthalungra. The pressure in the eye was recorded at 948 hPa. Severe wind damage occurred at Ayr Home Hill and Bowen. A man was killed at Ayr when a shop fell on him. At Ayr 33% of the homes were severely damaged. At Home Hill 100 people were left homeless. No building escaped damage. 700 wind-mills were destroyed in the district. The anemometer at Bowen recorded wind gusts up to 100 knots over a 2 h period with forty homes totally destroyed, 190 badly damaged and 300 partly wrecked. Severe damage occurred to the powerhouse, the salt works, coke works and railways. Dozens of boats were swamped. Floods extended down to north-east New South Wales, where a man was killed by fallen power lines. 28–30 January 1967 TC Dinah caused severe damage at Heron Island. The initial damage was caused by inundation from large north-easterly swells and then a day later by strong winds. The TC recurved and passed over Sandy Cape which recorded a central pressure of 944.8 hPa and high water 10 m above normal. Although the TC was well off the coast many trees were blown down from Rockhampton to Grafton. Houses were unroofed at Bundaberg Maryborough and along the Sunshine and Gold Coasts. Storm surge inundated cane farms at Bli Bli and was knee deep in Hastings St Noosa. Around Sandgate seawater 1.5 m deep came into houses. More than one hundred homes were flooded and at Cribb Island one house was washed into the sea. Storm surge also affected the Gold Coast and water lapped the decking of the Jubilee Bridge which is about 1.5 m above highest astronomical tide. A similar storm occurred on the Tweed River isolating Fingal. A section of the esplanade collapsed at Surfers Paradise. 17 January 1970 Small TC Ada passed through Whitsunday Group. The TC then hit the mainland. The eye diameter was approximately 20 km. A central pressure of 962 hPa was recorded at Airlie Beach. 14 lives were lost. Tourist resorts were destroyed and 80% of the buildings at Airlie Beach were badly damaged. 24 December 1971 TC Althea crossed the coast just north of Townsville. A 106 knot gust was reported at the Townsville Meteorological Office. There were three deaths in Townsville and damage costs in the Townsville region reached 50 million (1971) Australian dollars. Many houses were damaged or destroyed (including 200 Housing Commission homes) by the winds. On Magnetic Island 90% of the houses were damaged or destroyed. A 3.66 m storm surge was recorded at Toolakea. 11 February 1972 TC Daisy made landfall on Fraser Island. The pressure at Sandy Cape dropped to 968.8 hPa. 200 homes were damaged at Pialba and more houses were unroofed in widely scattered townships. Forestry officials reported serious damage to forests near Maryborough and on Fraser Island. Severe beach erosion occurred down to Brunswick Heads and on the western side of Fraser Island where a 3 m storm surge was reported. 2 April 1972 TC Emily crossed the coast in a sparsely populated area just to the south-east of Gladstone. Wind damage was confined to trees and sheds. The cyclone had been very severe out to sea and generated huge seas. It claimed the lives of 8 seaman in three separate incidents off the southern and central Queensland coasts. 19 January 1976 TC David crossed to the north of St Lawrence. It passed over Gannet Cay automatic weather station where a central pressure of 970 hPa was recorded after which the cyclone continued to intensify right up to the time of landfall. It crossed the coast in a sparsely populated area. Winds unroofed 30 buildings in Yeppoon and several in Mt Morgan. Wind gusts reached 95 knots at Pine Islet and 84 knots at the Gladstone Meteorological Office. Large seas combined with high tides and caused considerable damage to breakwaters, retaining walls and other structures. At Rosslyn Bay Harbour (Yeppoon) the Breakwater, yachts and trawlers were destroyed. 24 February 1980 TC Simon made landfall in a remote part of the coast north of Yeppoon. It caused extensive damage to vegetation. It then moved back out to sea and passed the north of Heron Island which experienced wind gusts to 93 knots and a great deal of damage. Neap tides saved the Island from swell damage. As the cyclone passed to the east of Fraser Island a ship near Indian Head reported wind speeds greater than 100 knots. Sandy Cape Lighthouse reported winds gusting to 92 knots. Houses lost roofing iron at Hervey Bay where there was flooding. 1 February 1986 TC Winifred crossed the coast just south of Innisfail. The worst affected areas were between Babinda and Tully. Instrumentation at Cowley Beach, which was near the southern eye wall at landfall, showed the maximum 10 min average wind was between 68 knots and 83 knots. Further to the north the maximum gust at Cairns was 64 knots. Central pressures of 958 hPa were observed at both Cowley Beach and South Johnstone. A house was severely damaged on a 70 m ridge north of Innisfail and was calculated by James Cook University to have been hit by a 145 knot gust. Hundreds of houses were severely damaged between Cairns and Tully. There were 3 deaths, two from wind effects and one drowning. 4 April 1989 TC Aivu crossed the coast near Ayr. A pressure of 959 hPa was recorded in the eye at Fredericksfield which is 20 km inland from the coast. Wind destroyed some houses, and the loss of roofing iron and iron awnings. A 3 m storm surge destroyed numerous beachfront properties in Upstart Bay and one man drowned. Major flooding occurred in the Pioneer and Proserpine Rivers. As Aivu approached the coast during 2 April flood rains affected south-east Queensland and north-east NSW. Seven people were lost presumed drowned (two in Brisbane, two in the Gold Coast Hinterland and three in north-east NSW). March 2006 TC Larry crossed the tropical north Queensland coast near Innisfail during the morning of 20 March, 2006. Major damage to homes and other buildings was caused by Larry as well as extensive damage to local crops. Larry reached Category 5 for a time just before landfall. As at 30/10/2006 there were 30,594 insurance claims for a total of 14,000 houses of which 500 were written off. Building costs estimated at 1.5 billion 2006 AUD. Sugar industry losses were around 200 million AUD with total crop losses exceeding 0.5 billion 2006 AUD. The worst town affected being Silkwood with 99% of the houses damaged. Examples of the extreme wind damage were 4 high voltage transmission towers blown down along the Palmerston Highway and another north of Babinda. An Australian record wind gust of 293.7 km/h was recorded on the eastern slope of Mt Bellenden Ker from a CSIRO anemometer. Very large storm surges (debris lines to 5 m above MSL) were measured in the Bingil Bay area. Note that TC Hamish occurred off the coast of Queensland in 2008/09 but did not make landfall. For consistency and homogeneity it was not included in the analysis. 21 March 2010 TC Ului made landfall near Airlie Beach on the Whitsunday Coast at approximately 1.30 am (Category 3). Nearby on Hamilton Island the maximum average winds of 93 knots (172 km/h) were recorded with peak wind gusts of 109 knots (202 km/h). Record wave heights were registered on the Mackay wave recording station with a significant wave height of 5.6 m and a peak wave high of 9.4 m. The highest storm surge measured was 2.5 m on the Laguna Quays tide gauge. Significant wind damage was reported around the Central Coast and Whitsundays district, mainly between Airlie Beach and Mackay. Reports of damage include widespread tree damage, large areas of sugarcane destroyed and localised structural damage, particularly to roofs. There was severe structural wind damage in the remote Midge Point area where radar indicated the strongest winds to affect habituated areas were located. Many boats were also damaged or destroyed due to large seas and swell created by Ului, particularly around Shute Harbour and Airlie Beach. The severe TCs below are included here for completeness. They are not included in the analysis because we are less confident that all TCs were detected during this earlier period. February 1863 A TC brought damaging winds and seas to region between Rockhampton and Hervey Bay. Houses were unroofed in several centres with many trees blown down. A ketch driven onto rocks near Rockhampton. There was severe erosion along shores of Hervey Bay with 10 m lost to sea along a 32 km stretch of the coast. Twenty acres of forest were also lost to the sea. At noon on Friday 13th February 1863 two emigrant ships, the ‘Everton’ and ‘Wanata’, were struck by a cyclonic gale while anchored off the northern end of Moreton Bay and both had to run out to sea. The winds eased by noon the next day and they were able to return to the Bay. On the 16th February the schooner ‘Bounaparte’ arrived in Moreton Bay badly damaged. It had encountered the cyclone 100 km north of Breaksea Spit and lost both masts and sustained much damage to its bulwarks. See ‘Below these Mountains’ By Lyall Ford published by Taipan Press Freshwater, QLD. 17–19 March 1864 Long period of gales in Brisbane. Houses were blown down, rooves and portion of rooves were carried away and a stone jetty was washed away. Severe flooding occurred. The barque Panama (414) tons, was wrecked near Sandy Cape with 11 lives lost. 2–3 March 1867 A TC hit Bowen on the 2nd. Many buildings unroofed. The TC hit Townsville on the 3rd. Almost every building in the town was blown down. 30 January 1870 TC hit Bowen. There was much damage in the town. One man was killed by a falling house. There was heavy flooding south of Bowen. Disastrous flooding occurred in central Queensland. In all 15 lives were lost. 20 February 1870 A TC hit Townsville. A steamer and a schooner were wrecked. Nearly every house damaged and some completely unroofed. 5 March 1899 TC Mahina crossed the coast at Princess Charlotte Bay. A barometer read at 914 hPa in the eye. 307 known fatalities. Unfortunately census records for Aboriginal people at the time were not kept, and so this official figure does not include confirmed reports that approximately 100 Aborigines were swept out to sea or killed by widespread falling trees. 4 March 1906 TC made landfall to the north of Cairns but no available evidence suggests that it caused damage in Cairns. It later wrecked the inland town of Croydon (just over 400 km WSW of Cairns). Two churches were wrecked and another was blown off its stumps. The Post office lost part of its roof and the Court House was damaged. Three hotels were severely damaged and only portions of another two were left standing. Two houses were wrecked and all buildings more or less suffered with scores of people homeless. 19 January 1907 TC crossed the coast just to the north of Cooktown. Many buildings were totally wrecked including 3 churches, two schools, 4 halls, 3 hotels, several shops and a large number of houses. There were 9 deaths. 3 February 1920 TC crossed the coast near Port Douglas. Pressure dropped to 962 hPa. The town was practically demolished. At Cairns a café was razed to the ground, most of the houses along the waterfront were unroofed, two hotels were badly damaged, a building was overturned and street trees were blown down. The sea came over the seawall and into the streets becoming 4 feet deep over the Esplanade. Many people took refuge from the sea on the upper portions of their homes and several people were rescued. Nearly every house in Kuranda was unroofed. 12 March 1934 TC crossed the coast near Cape Tribulation. There were reports of a 9.1 m storm surge at nearby Bailey Creek which destroyed banana plantations. The Pearling fleet just off the coast near Cape Tribulation was devastated with many luggers and 75 lives lost. Banana plantation settlers in the Cape Tribulation area stated that the centre of the cyclone was over Bailey’s Creek where huge trees 4 feet across were snapped like carrots. At Daintree the pressure dropped to 978 hPa. Huge trees were snapped and all vegetation was defoliated. Three houses were totally demolished, one house had its veranda torn off, one house was torn in half and one half blown away. Another house was lifted and turned upside down. The sawmill was unroofed. 17–18 March 1945 A small TC crossed the coast south of Cooktown. A ship 195 km ESE of Cooktown reported a pressure of 978 hPa and 80 knot winds. A Netherlands Merchant ship, the Sibigo, was bashed by huge seas and developed engine trouble and could only steer into the wind. At 5.30 pm Friday 16 March 1945 the Captain gave the order to abandon ship and minutes later the Sibigo sunk. Extensive air and sea searches rescued 13 of the 85 crew. 72 seaman were lost at sea. Two ships heard the Sibigo’s S.O.S, and one ship got within 30 nm of her but could not get much closer. By 6 am Saturday 17 March 1945 the wind reached 80 to 100 knots. 10 February 1949 TC crossed the coast north of Cooktown. Only 12 of the towns’ 125 houses were left intact. 30 were flattened, 40 badly damaged and others required repairs. 300 people were left homeless out of a population of 420. Five business houses out of the 25 were wrecked with the others damaged, some extensively. Big seas washed away part of the Cairns to Mossman Road. 19 March 1990 TC Ivor crossed the coast near Princess Charlotte Bay as it was weakening. There was some structural damage to sheds and light damage to the main buildings in Coen. There was evidence of a tornado track from a swath of damaged trees 100 m wide extending as far as the eye could see 40 km south of Coen. The vessel Mustique encountered sustained winds of 114.5 knots (maximum reading on the anemometer). The ship spent the period steaming between Flinders and Stanley Islands in Princess Charlotte Bay. The ship’s barometer fell to 928 hPa. The windward side of trees were stripped of bark. There was extensive damage to coral along the coast. The cyclone retained its identity as a monsoonal low and moved through the eastern Gulf and back down the east coast with heavy rain south of its centre. As it moved down the Central Coast unofficial 24 h falls of 1000 mm were reported. 11 February 1999 TC Rona made landfall just to the north of Cow Bay near the Daintree River mouth. The main wind damage extended from Newell Beach to Cape Tribulation with the major damage between Cape Kimberley and Cape Tribulation. Some trees in the Cape Tribulation area which survived the 1934 cyclone were felled by Rona. The maximum wind speeds were recorded by the Low Isle automatic weather station with 10 min average winds to 71 knots and a maximum wind gust of 85 knots. The lowest pressure of 983.0 hPa (not in the eye) was recorded at Low Isle. A 1 m storm surge was recorded at Port Douglas (at low tide) and a 1.4 m surge was recorded at the mouth of the Mossman River. These sites were south of the maximum wind zone where the largest storm surge would be expected. Major flooding occurred between Cairns and Townsville. Despite the confined wind fetch inside the Barrier Reef, Rona generated some large waves as indicated from wave recording stations run by the Beach Protection Authority. At the Low Islet station the peak significant wave height (the average of the one-third highest waves in a 26.6 min period) exceeded 3.5 m and the maximum wave height exceeded 6.3 m. The Cairns station recorded significant wave heights to 2.49 m and a peak height of 4.65 m. These were record heights (since recordings commenced in 1975) for Cairns although readings were missed when tropical cyclone Justin made landfall near Cairns in March 1997. At Dunk Island the corresponding readings were 3.06 and 5.69 m. There was major damage to crops and infrastructure in the Douglas Shire and major damage to crops between Townsville and Cairns. 10 March 2005 TC Ingrid made landfall on a remote part of the east coast of Cape York Peninsula as a severe tropical cyclone. It was a small system in size and severe damage was confined to a 40 km wide swathe close to the coastal crossing near Bombart Point. A storm surge survey measured a surge of 2.8 m. Trees were blown down across the Cape as it continued westward after crossing the east coast. April 2006 TC Monica made landfall on a remote part of the east coast of Cape York Peninsula south of Lockhart River as a severe tropical cyclone. Lockhart River reported a maximum wind gust of 109 km/h at Lockhart River, 3 pm EST 19 April and a lowest MSL pressure of 986.0 hPa. Highest rain totals were 215 mm at Lockhart River in the 24 h until 9 am on 19 April; 239 mm at Violet Vale in the 24 h until 9 am on 20 April; and 282 mm at Musgrave in the 24 h until 9 am on 21 April. Flood damage occurred. Strathmay Station (Western Cape) recorded 800 mm on top of an already large wet resulting in 25 cm of water running through the house and a wall of water 5 km-wide and up to 4 m deep running across the property. Owners state that the local aboriginals had confirmed that the land around the house had never previously flooded (approx. 100 years). Lotus Bird Lodge (Eastern Cape) experienced 3 m deep floodwaters through its 4 star accommodation lodge. There was little structural damage from the cyclone (except for around Lockhart River where Cyclone Monica struck). Damage and impact was largely flood related—decimated roads, significant stock losses, buildings and contents water damaged, trees down, plant and equipment flooded.